I like to walk around my backyard and take photos of the flowers in my gardens and I thought this single one had something special to it. This is a well crafted shot of a flower; and it’s nice to know that while many in the northern hemisphere shiver, at least someone is getting some sun! Things that are good about Amy’s photo here are the closeness to the flower. She has managed to get in really close to the petal to isolate it from any surrounding distractions. The light here is good too. The flower is partly shaded from above, leaving dappled light falling on our petals. 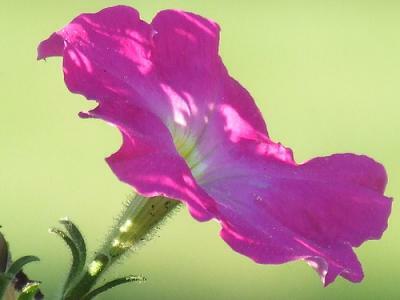 This has given the flower a touch more contrast than if it were completely in the sun. I like the crop too. I’m not sure if Any cropped this later using software or if this is how she took the shot, but it’s spot on – the petals reaching right to the edge of the frame, but not too far to cut off any edges. There’s only two aspects of this photo that I would like to change, and they are small things. The first would be to rotate the camera around to the right just a little, so that we see the flower just a little more ‘head-on’. Not too far though, because it would be a shame to lose the stem, but just a little. All in all though, nice shot! Thanks Amy for your submission.